The goal of the Starkville Visitors & Convention Council (VCC) Sponsorship Grant Program is to fund tourism and community development projects that positively impact the City of Starkville and Oktibbeha County’s economy. Deadline for applications: September 7, 2018 by 5:00 p.m.
All organizations, events, or programs applying for the first time; having received funding for one or two consecutive years; having received funding for non-consecutive years; or that have been denied for the Sustaining Grant or Dues categories should apply in the Sponsored Programs category. Organizations, events, or programs are eligible for the Sustaining Grant category if they have received three (3) consecutive years of funding from the Starkville VCC. If approved for the Sustaining Grant category, organizations, events, or programs will receive a commitment of dedicated funding for a three (3) year period. Dues collecting organizations are eligible for the Dues category if they have received three (3) consecutive years of funding from the Starkville VCC. If approved for the Dues category, organizations, events, or programs will receive a commitment of dedicated funding for a three (3) year period. Applications must be made online and must be submitted no later than September 7, 2018 by 5:00 p.m. All submissions will be electronically time stamped. Marketing plan and budget: You may use the template provided or create your own. ALL promotions and advertising must be included in plan. Please include all print, radio, television, billboards, social media, etc. in your plan and budget. Selection criteria can be found within the guidelines of the Starkville VCC Sponsorship Grant Program. Applicants will be notified in writing of their status regarding funding within 30 days of submission. 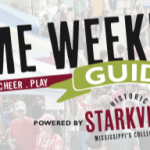 If you have any questions regarding the Starkville VCC Sponsorship Program Guidelines and/or application, please contact Jennifer Prather at 323-3322 or jprather@starkville.org.